Another short day today, just 10 nautical miles from Warm Springs Bay to Ell Cove. 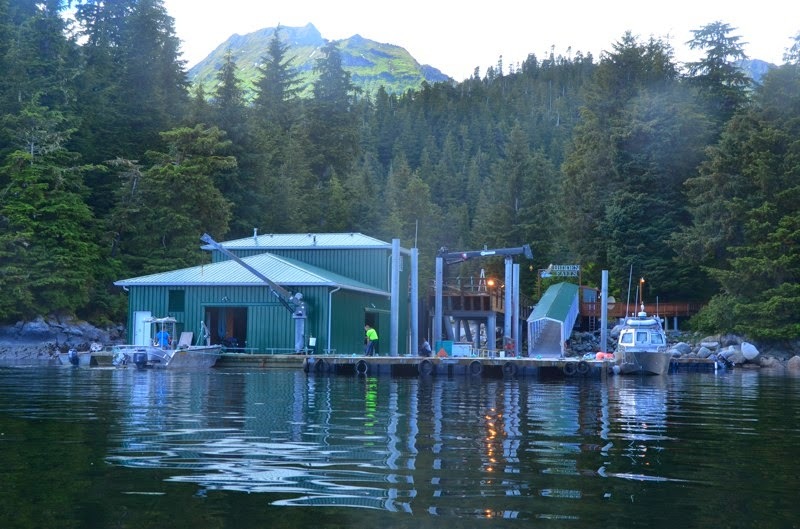 Ell Cove is an attractive anchorage, but the real draw is Hidden Falls Hatchery, just a short dinghy ride away. 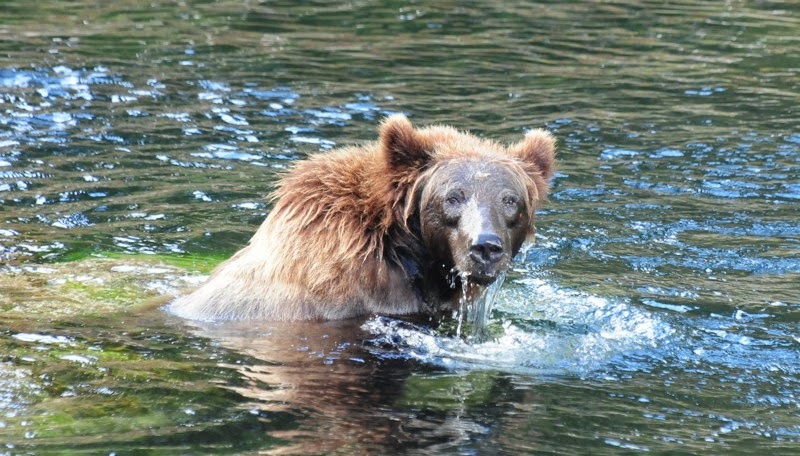 The hatchery attracts bears, and a trail up to a lake is a good place to stretch our legs. Today is a seine opening, and Chatham Strait is choked with fishermen. I zig and zag to avoid their nets. It’s always a bit nerve wracking operating the boats near the nets. After dropping the anchor in Ell Cove we dinghy into the hatchery. No bears at first, but one emerges from the bushes fairly quickly. After watching him fail at fishing for a bit, we take the short but steep trail up to the lake. Thankfully, no bears on the trail. Hidden Falls Hatchery. Visitors can tie dinghies to the dock. 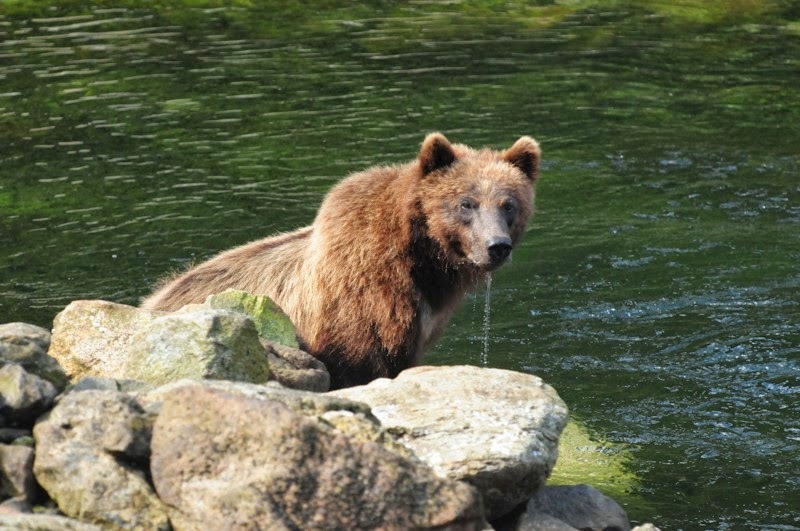 A bear, perhaps the same bear, is back at the creek when we get down from the lake. It’s still failing at fishing. After trying several times, including dunking his head, he walks off towards the lake and swims across it. 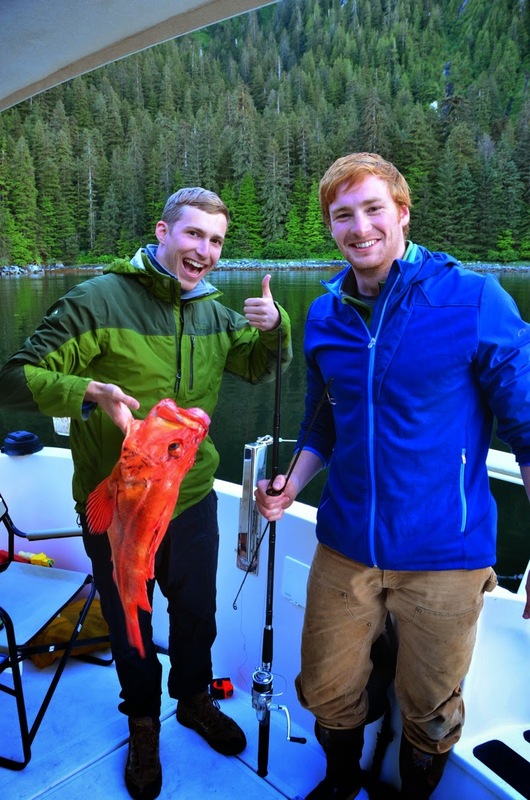 Later Brendan and Jordan try their hand at fishing for halibut. We have none of the right gear­—just a cheap trout rod and a few lures. Very quickly they get a bite, then the rod snaps in the middle. No worries, as the fish quickly gives up the fight. By the time the fish reached the surface it was dead. Not a halibut, but a yellow eye rockfish. Apparently good eating. Brendan and Jordan with their catch. A sailboat named Sarita is also in Ell Cove, and we visit with the owners. They’re Australian and British and wandering the world with their 12-year-old daughter. Neat life. We borrow some fishing gear from them and take another stab at a halibut. No luck, but we do get a fresh salmon from one of the seiners. The folks on Sarita invited us aboard for drinks, then dinner. They planned to go to a nearby sandy beach for a bonfire that evening and invited us to join them. We enjoyed hearing about their adventures and future plans.